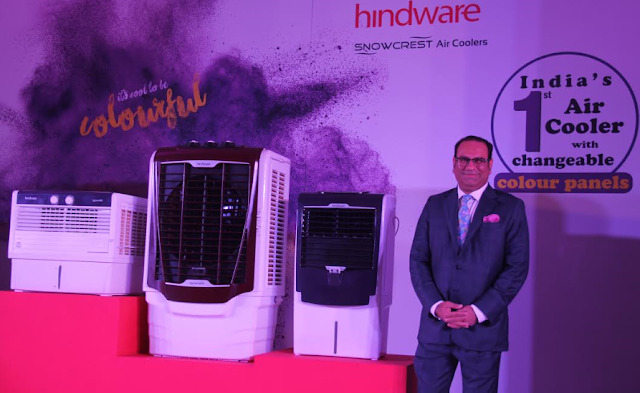 HYDERABAD, February 21st, 2017: HSIL Limited, promoters of brand hindware - the leader in sanitary ware market in India, today announced the launch of their latest line of air coolers with changeable colorful front panels under their brand Hindware Snowcrest. The latest line of air coolers unveiled will bolster the versatile and comprehensive Consumer Products Division of HSIL. The growing market of air coolers of INR 3,650 crores currently has a low penetration of 10%, however it is witnessing a volume CAGR of 16% from FY14-FY17. With the organized market contributing to only 1/3rd of the market, the range of air coolers will help HSIL propel its presence. The new range of air coolers launched under – Desert, Personal and Window categories are available in fourteen models ranging from 18 liters to 100 liters. The changeable color panels available in select models come in three colors as of now – premium purple, brick red & icy grey. With a high air delivery rate of up to 3800 m3/hr., the series is engineered to consume less power and produce exceptional cooling comfort. The trendy coolers range starts from INR 8,990/- and goes up to INR 17,990/-. With their smart craftsmanship and design, the Hindware Snowcrest air coolers promise to set a new benchmark in the segment with its technological and aesthetical advancement. The first of its kind, graceful and changeable color panels, not only provide the consumers an opportunity to showcase their individual style, but also blends seamlessly with the interiors. The air coolers are imbibed with a unique Anti-Skid Top Cover which provides additional grip and storage for placing objects, and a distinctive ice chamber which helps in faster cooling of the room. The coolers launched under Desert, Personal and Window categories, also come with 4-way air deflection and digital display panel with remote operation for fan, speed and timer control. In personal cooler model, a pocket is provided for placing the remote & stylish handle at top helps in easy placement of the cooler. Many other smart features like shut louvers, dust filter, etc. make the product stand class apart. HSIL Limited, a listed company, is the leading player in the Indian sanitaryware industry and is the 2nd largest in ‘container glass’ in South India. HSIL limited has three business segments namely Building Products Division having Sanitaryware products under brands like Queo, hindware Italian Collection, hindware Art, Benelave, Raasi, Amore & home decor solutions under Evok; Packaging Products Division under Associated Glass Industries & Garden Polymers; and Consumer Products Division having home solution products under brands such as hindware Kitchen Ensemble, hindware Atlantic, hindwareSnowcrest, Moonbow&hindware Vents.